← Cree language courses in Saskatoon and Edmonton! Thanks to NCI-FM for permission to use this backstage photo. 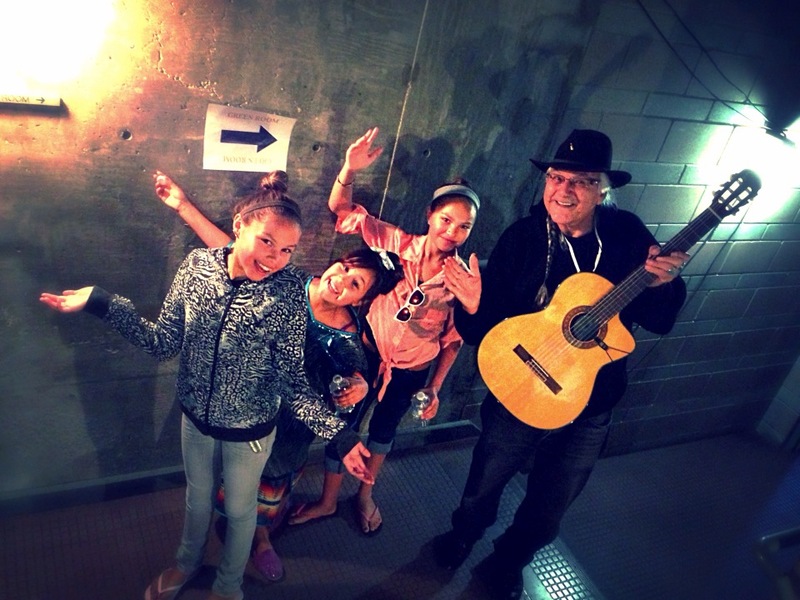 At the recent NCI-FM “NCI Jam” Winston Wuttunee performed his classic favourite Ninêstosin along with singers and dancers from Winnipeg’s Aboriginal School of Dance. Clearly from this backstage rehearsal photo, none of them were tired yet! Many of Winston’s recordings are available for download through iTunes. I am tired, I am tired. I want to go home. I am tired. I am going home. Do you understand? I am going home. Do you hear? I am going home. I am going home, my little sweetheart. We’ll play again and have fun when the sun is shining. I am tired, I am going home. I’ll see you again when the leaves come out. This entry was posted in Songs in Cree and tagged SRO, Syllabics, Winston Wuttunee, y-dialect. Bookmark the permalink. I can’t either. I guess it’s been removed from *their* server. Thanks for letting me know.